I don’t know about your schools, but ours have a strict “no nut” policy. As you might imagine, this takes a lot of the ease out of lunch-making. No more peanut butter and jelly sandwiches. No more trail mix. No Nutella…ya, that one stings. No almonds. No almond butter. No granola bars unless they are free of nuts. Yeesh. 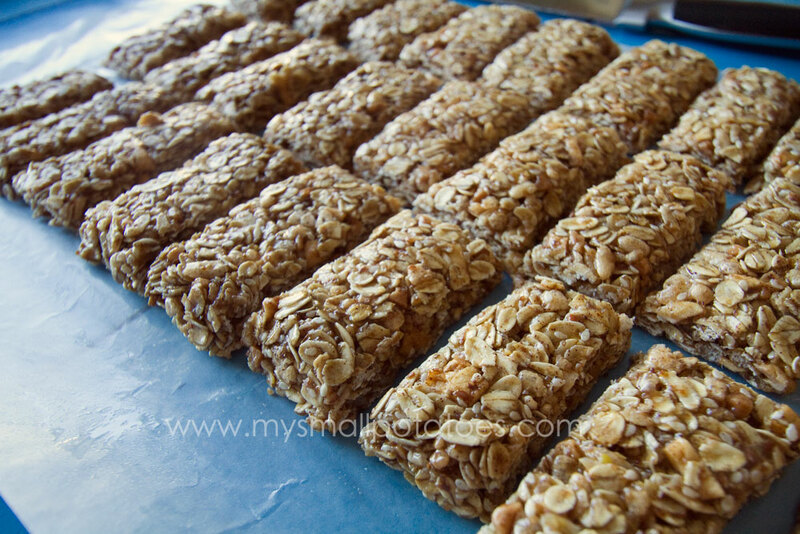 I didn’t want to give up granola or granola bars entirely, so I started making my own. 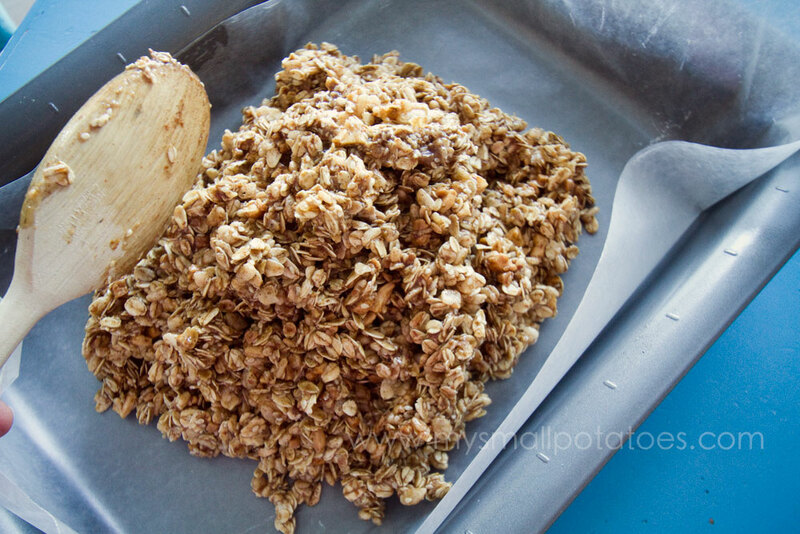 This recipe is perfect for lunch boxes, and it’s easy to make…no baking required! They are chewy, delicious, and also gluten-free, which I suppose is another difficult obstacle to overcome when it comes to lunch-making. 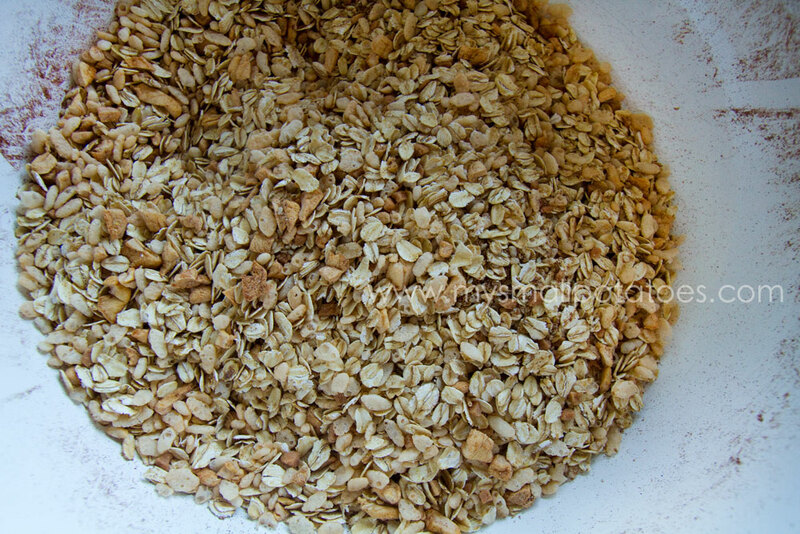 Gather all your dry ingredients in a big mixing bowl and stir them up. 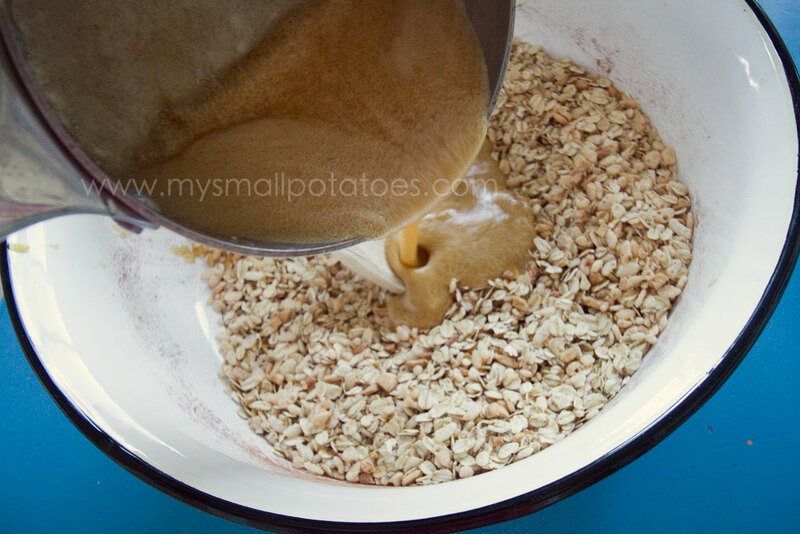 I added the cinnamon to the dry ingredients, but you can add it in your wet ingredients if you prefer… Put all your wet ingredients together in a saucepan on medium heat. Stir until melted. Bring to a boil for 60 seconds, stirring constantly. The 60 seconds is important. 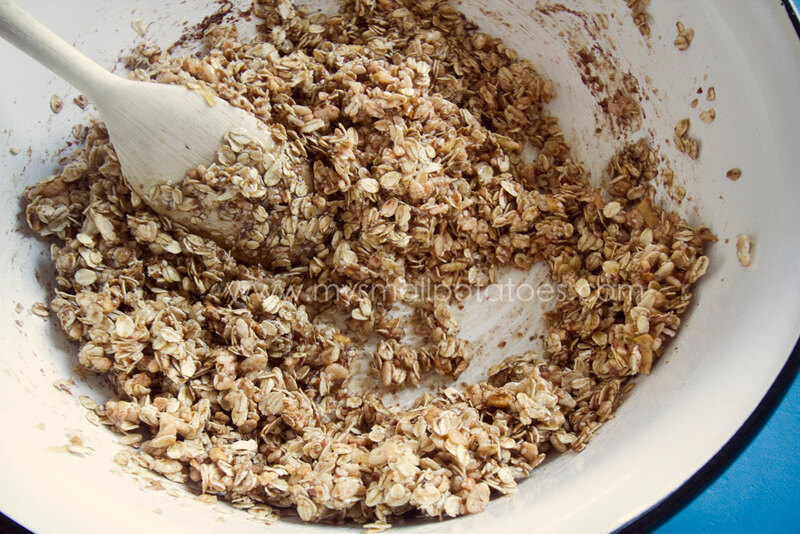 If you boil your sugars too long, your granola bars will be hard and crunchy. If you underboil them, your bars will crumble apart. 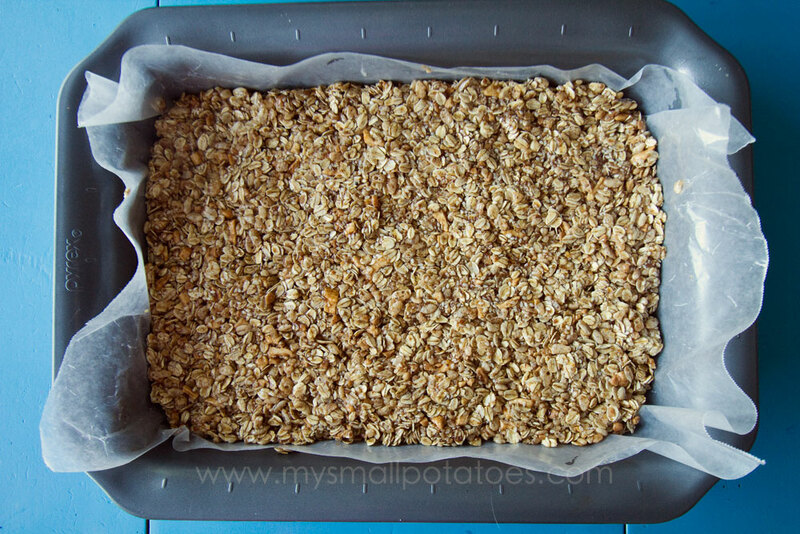 Once you’ve reached the 60 second mark, remove from heat and pour over your dry ingredients… Mix thoroughly… Now pour your bars into a wax paper-lined 9×13 pan. 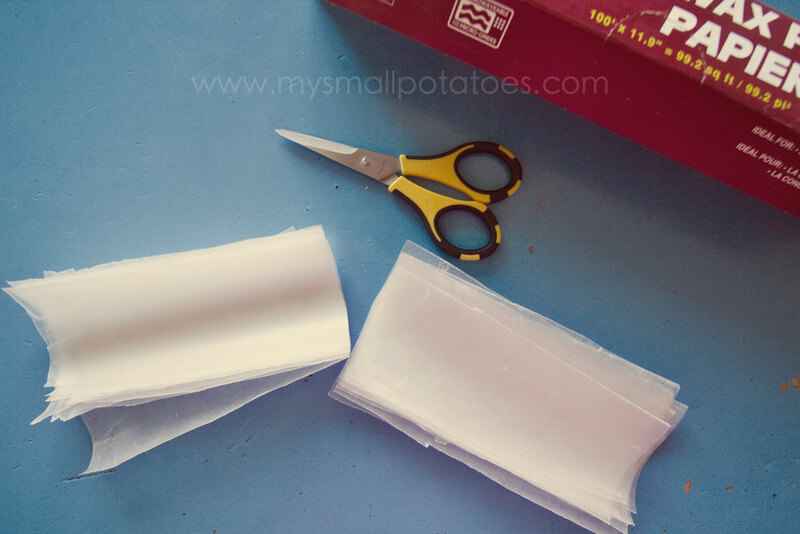 I also spray the wax paper with a little bit of cooking spray so the bars are easily peeled from the wax paper. The wax paper is optional. I use it because I don’t like to do dishes, and it makes it easier to remove the bars from the pan for cutting… Press the bars into your pan with the spoon. Then butter your hands and press them in good and tight. The tighter you press them in, the better your bars will stay together when cooled… Now you can sit back and relax while the bars cool. 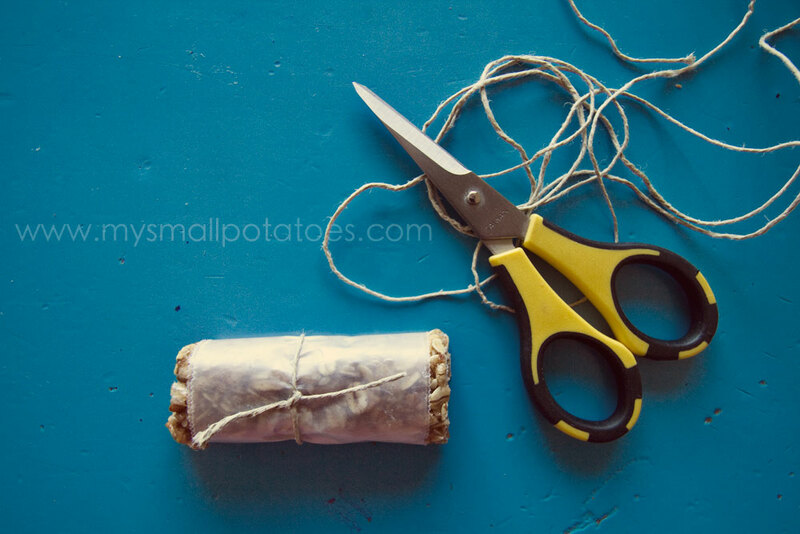 Once they have cooled, lift the wax paper and all the bars out onto your cutting board and slice them into segments the size of your choosing. 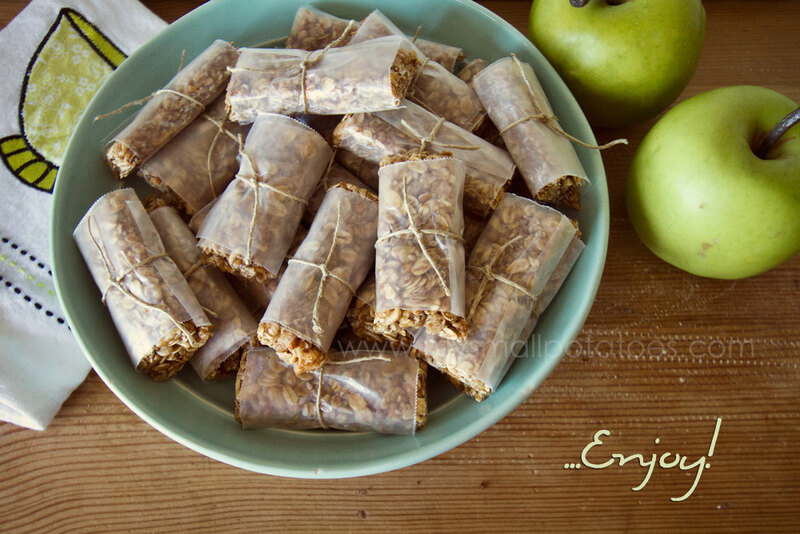 I can usually get 8 bars by 3 bars, leaving me with 24 full bars… While my bars are cooling, I slice off 12 small strips of wax paper and then cut my strips in half, leaving me with 24 granola bar “wrappers.” I use kitchen twine to tie the wax paper wrappers closed, but you could use a sticky tape if you prefer… And there you have it! 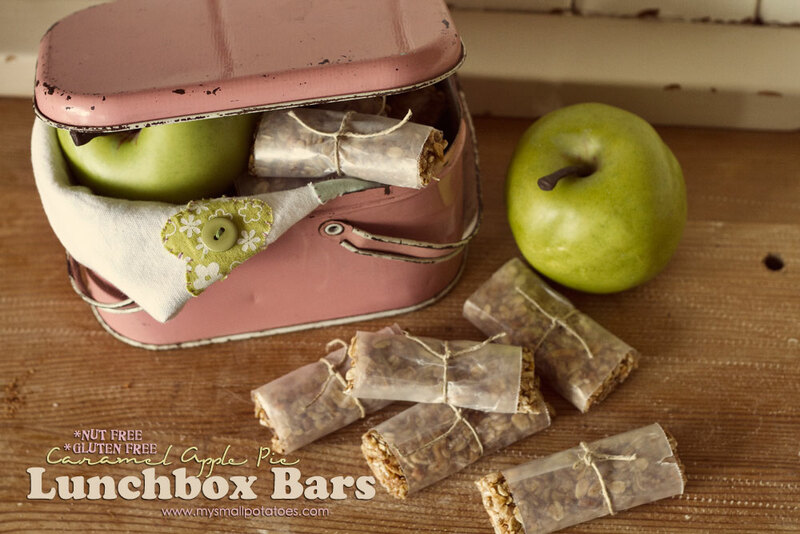 Delicious, gluten-free, nut-free, no-bake, picky-eater approved lunchbox bars! These bars will last up to 3 weeks on your counter. We keep ours in a jar on the kitchen shelf. Oh my goodness these are being made ASAP in this house! Thanks for a great recipe!! We did not use skor bar…we used the skor caramel chips from the baking section at the grocery market…our school said those were ok! Woot! I’m always calling the secretary to find out about foods allowed and not allowed…I’m pretty sure she’s sick of me! Lol! Goodness! These sound delicious! Can’t wait to try the recipe. 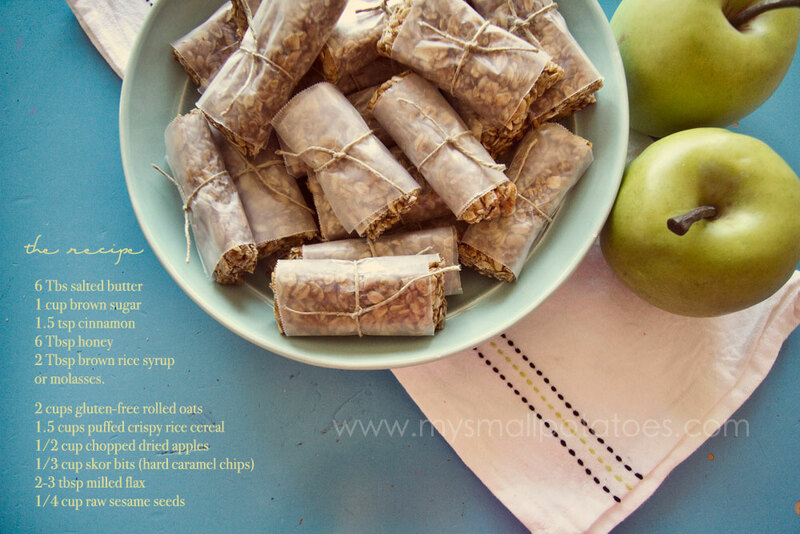 I love the way you wrapped the bars… cant wait to try them! Great recipe, delicious. Just a note though, I noticed when making these that the third ingredient on the chippits Skor chips is almonds. So they aren’t allowed at our school. Do you know of another alternative? You can just leave them out 🙂 Our school said it was ok, thank goodness! Can you use fresh apples as well?